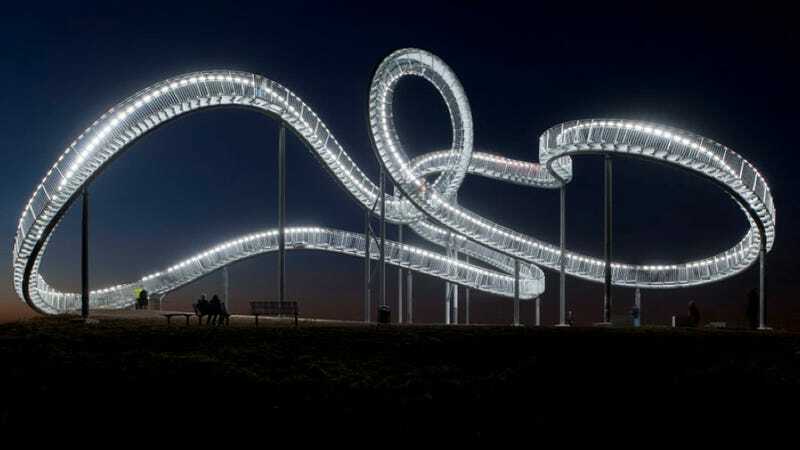 When night falls, the LED lights integrated into Tiger & Turtle - Magic Mountain cause the serpentine sculpture to look more like the jetwall of a lightcycle than a never-ending (albeit impassable) staircase — but that's precisely what this towering structure is. The dynamic sweeps and curves of the construction inscribe themselves like a signature into the scenery...From a distance the metallic glossy track creates the impression of speed and exceeding acceleration. Viewed from close up, the supposed lane turns out to be a stairway which, elaborately winding, follows the course of the rollercoaster. The visitor can climb the art work by foot. Although the course describes a closed loop, it is impossible to accomplish it as the looping emerges to be a physical barrier. Tiger & Turtle - Magic Mountain is on display and open to the public at the Henry Hildebrand Höhe in Duisburg Wanheim, Germany. See more images of the coaster-case over at archdaily.